Aside from the carbonation issues,its a good Pale Märzen. Poured a golden colour, medium thick head which faded, kept some lacing which in turn also faded, clear. Aroma was malt, and caramel with some slight hop. Tasted apple and malt, was slightly peppery, finish was slightly bitter sweet. Initially well carbonated but lost some of it's gas, body was medium to thick, smoothed out over time. Unspectacular but solid Festbier which bordered a lower ABV Heller Bock. Catch up rating. Poured a gold ben hue medium head which faded, streaky lacing , clear. Scent was mostlymalt, with very light hop presence. Malt follows in the flavor as well, slightly fruity. Fairly effervescent. Nice marzen, with some malty bock character. It pours a nice rich golden peach color with a frothy head that leaves some nice lacing. The smell is decently clean and grainy with some honey and fruit notes and some nuttiness. It isn't a huge aroma but it is pleasant. The flavor ramps it up a notch. It has a lot of classic Helles qualities, but an added dose of sweetness and body that is welcomed. There is some nice hop flavors as well. The finish is slightly bittersweet, but not cloying. Overall it isn't an archetypal Maerzen, but it is pretty tasty. Thanks to digita7693 for being my European Beer contact and sendin me these. Pours a crisp golden clear. Very nice head with nice lacing. Nice crisp pils aroma. Smells nice and bready but not very complex. Tastes great. Very crisp and refreshing. Nice and malty with a good pils lager taste. Mouthfeel is nice and malty for a pils but still crisp and great carb. I picked up a 0.5l bottle of this at the Edeka Markt in Rothenburg for 0.79EU (plus 0.08 dep). Quaffed while enjoying a lovely day in the neaby Burggarten on 29SEP09. Best before date is 26OCT09. 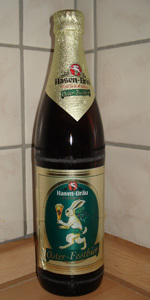 This Hasen offering is a clear, medium to dark golden shade, with a smooth off-white head. It's short but covers well, though leaves minimal stick. Has a bready malt nose, with a touch of toast, though it's mild. Good overall mouthfeel, a bit bubbly and light on the tongue, with a solid medium for body. Flavor has a solid foundation of toasty and bready malts. Sweetness is there yet nicely restrained, at a pleasing level. Floral hops add a delicate balance at the finish, but don't linger. Thought while quaffing that this fit into the Märzen category, and I see here on BA that's what it be... It hit the spot well. Prosit!! BB 30/11/2008, served chilled in a pilsner glass. A: pours a dark straw hue, lively carbonation full of tiny bubbles, topped with a cottony white foamy head with ok retention. S: a pretty decent level of lager-maltiness comes before a mildly floral-hoppy note and the decent sweet starfruity/lemony note of a well-lagered beer, while a swirl wakes up a mildly doughy touch. Alas, apart from these the aroma has nothing else to show. T: rather tart-fruity upfront, a bit like starfruits, with a syrupy touch of malts, then being taken over by a rich flavour of bitter-sweet, honey-ish and faintly peanut-y lager malts that has a semi-chewy toasty element to it. Finish is decently bitter-sweet, added with a touch of dried grass in the hop bitterness. M&D: quite refreshing, somewhat lacking the weight for a 6%abv. beer and also a tad watery in the finish, but overall easy drinking. IMO, this beer needs a slightly heavier maltiness for a decent gravity, but the soothing aftertaste of bitter-sweet hops seems to elevate the whole performance a bit. Not bad, albeit simplistic. Mild malty aroma with a nice spicy hop edge. Tall foamy white head faded quickly. Transparent golden beer holds a few streams of bubbles. Sweet pale malt flavor is a bit grainy and it's joined by some alcohol and black tea flavors. The finish is sweet and alcoholic. Mouthfeel is moderately full and a bit watery. I don't know where the alcohol is coming from, but it's fairly strong. A mediocre fest-bier, which isn't one of my favorite styles anyway. This has the appearance of a good maerzen: ample amounts of off-white head that sticks around a bit longer than a typical maerzen, with a crystal clear light copperish colored body. Lacy stickiness lasts the whole way through. The aroma is malty and tart at the same time, hints of burnt toast. The taste is mellow and weak. This brew actually has no dominant characteristics in the way of taste, except for a hint of honey. Just a watered down tasting maerzen. This feels smooth and is very drinkable. There is an ample amount of alcohol here, which surprises me for the weak taste.